The Four-Hand Piano Duo will perform on Friday, November 16, from 7:30 to 9 p.m. at the Northshore UU Church in the second event of this season’s “Music in the Woods” series. Tickets are $20 for adults, $15 for seniors and students, and free for children under 12. Bonnie Anderson and Donna Gross Javel are fast becoming known both for their creative and varied programming as well as their uncanny ability to make four hands look and sound like two. 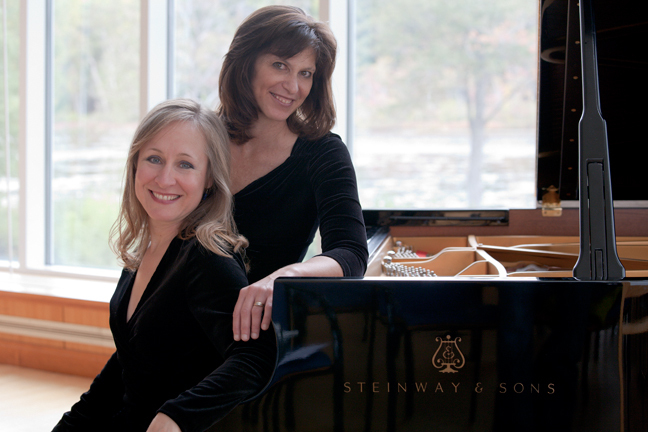 They have been performing together as the Four-Hand Piano Duo for enthusiastic audiences throughout the New England area ever since their 2004 debut performance in Danvers. They are often told that their enthusiasm and energy are contagious. In addition to the standard works of the classical repertoire, their programs often include music from the Living Composers: AnythingPiano Project (LCAPP). The fact that these compositions encompass such a broad range of styles and cultures adds to the excitement; audience response to the programming of these works has been electrifying. Bonnie Anderson made her debut with the Boston Symphony Orchestra at age 14, first as flute soloist and several months later as piano soloist performing the Grieg Piano Concerto. She has performed on both instruments in the United States, France, Germany, and South America. She has appeared with the Boston Pops, Peoria Symphony, Bach Society Orchestra of Harvard University, Northern Illinois Philharmonic, and the Bach Festival Orchestra. Anderson is an adjunct professor of piano and chair of the keyboard department at the University of Massachusetts Lowell. Donna Gross Javel, is the founder of the LCAPP. One of LCAPP’s missions is to increase audience enthusiasm and appreciation for new music through creative and varied programming. As a teenager Javel was selected by tge Leschetizky Association to perform at Carnegie Recital Hall under its auspices. Subsequent performances of solo and chamber music have occurred in such diverse venues as the Esterhazy Palace in Austria, the Frank Lloyd Wright-designed Zimmerman House in Manchester, New Hampshire, and Ventfort Hall in Lenox, Massachusetts. She is a frequent performer in the Boston area and has performed on “Morning Pro Musica,” a live broadcast from WGBH Radio in Boston. Her piano compositions have received favorable reviews in music journals and are available at select music stores in Massachusetts.